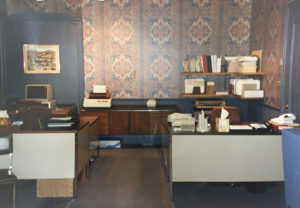 MRG’s state-of-the-art new offices, circa 1986, featuring a PC of our very own! The world of 1983, when my partners and I founded MRG, was significantly different in so many ways from today. Perhaps the most profound change has been technology. When the first MRG assessment instrument was created, we were sharing a single PC with an insurance agency down the hall from our office. That initial product was the Management Assessment Effectiveness Analysis (MEA) and was a self-assessment instrument only. John Kotter and Warren Bennis were still a couple of years away from drawing the distinction between managers and leaders, and assessment products were still in the very early stages of acceptance. It is important to remember that the business world, at this time, was still pretty conservative and not readily open to exploring new approaches. Assessment instruments also came from a psychological base, and there was a perception that assessments were revealing that something was wrong with a person. In a more buttoned-up era, many people found the idea of revealing, insightful assessment to be a bit frightening. By the late 1980’s we had added the LEA to the product mix and invested in a PC of our very own. However, the actual feedback reports were being hand produced, using Dennison stick-on dots to indicate an individual’s scores. 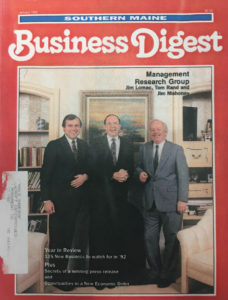 The author (left), alongside co-founders Tom Rand and Jim Mahoney, on the cover of Southern Maine Business Digest in 1992. By the early 90’s we had transitioned to computer-generated feedback reports, eliminating the need for the Dennison dots (I’ve asked around, and they have not been missed). Also, the acceptance of observer feedback was much more prevalent, which led to the creation of the LEA 360™. By this time, a significant shift had started to occur. First, MBTI had blanketed the earth and the general acceptance of assessments had increased significantly. Performance review methodology moved from being evaluative and remedial to being constructive and developmental. Secondly, coaching transitioned from the world of athletics to the world of business. Coaching was no longer a sign that there was a problem, but rather that one’s career was on the move. To facilitate their efforts, coaches wanted and needed reliable data, and LEA 360™ feedback was specifically designed for this purpose. The broad relevance of the LEA behaviors, combined with the assessment’s ability to capture the contextual subtleties of an individual leader’s environment, made it uniquely applicable to a wide range of organizational settings. In Jim’s next post, he continues on this journey through assessment history and bring us to the present day. Read it here.